10 quick facts about thyroid disease you are not aware of! #1:Hyperthyroidism refers to an increase in production of hormones by the gland. Some of the symptoms that could signal hyperthyroidism are weight loss despite a good appetite, enlargement in your neck, an increase in heart rate, shorter menstrual periods, high blood pressure, increased sweating, frequent bowel movements, nervousness and trembling hands. Here are few tips to deal with hyperthyroidism during pregnancy. #2:Hypothyroidism refers to a decrease in production of hormones by the gland. Some of the symptoms that could signal hypothyroidism are weight gain or failure to lose weight despite a proper weight loss regime, enlargement in the neck, reduced heart rate, increased cold sensitivity, lethargy, numbness in hands, dry skin and hair, heavy menstrual periods and constipation. #3: For hypothyroidism, your doctor might prescribe you thyroid hormone pills which you’ll need to take for life. For hyperthyroidism, you may be prescribed anti-thyroid medications and/or radioactive iodine. You doctor may also prescribe drugs to reduce symptoms like increased heart rate and tremors. 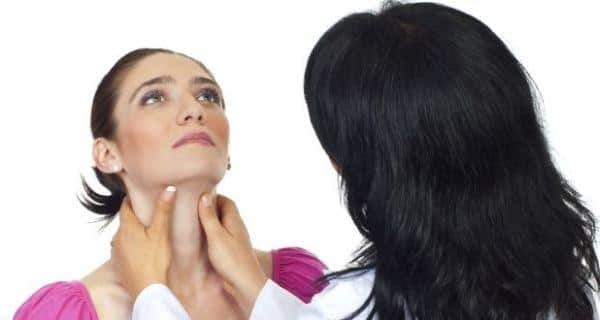 #4: A lump in the neck with pain and swollen lymph nodes, trouble in breathing and swallowing, hoarse voice are some of the symptoms that could signal thyroid cancer. In such cases, surgery is performed to remove the thyroid gland or a part of it along with radioactive iodine therapy. Here’s everything you should know about the thyroid gland. # 5: The factors that put you at an increased risk of thyroid disease are: family history of thyroid disease, type I diabetes, age, stress, thyroid surgery performed previously and Down’s or Turner’s syndrome. Women are more susceptible to thyroid problems than men especially during delivery and menopause, which are periods when there is a hormonal flux. # 6:Thyroid is diagnosed by tests like Thyroid profile which measure your Thyroid stimulating hormone or TSH. High TSH levels indicate hypothyroidism, and low TSH levels indicate hyperthyroidism. # 7: After the age of 35, you should ideally get screened for thyroid dysfunction once every five years. If you exhibit any of the symptoms or risk factors mentioned above, then you should get yourself screened more often. Are you aware of these 10 common causes of thyroid imbalance? # 8: If you are diagnosed with thyroid disease, it is important that you take it seriously and follow whatever instructions the doctor gives you. If left untreated, thyroid problems can lead to stroke, heart disease, infertility, Alzheimer’s and ultimately death. # 9: In order to keep your thyroid gland in mint condition, eat foods rich in nutrients like Iodine and Selenium. You can do so by eating iodized salt and seafood. Vegetarians can add spinach, garlic and sesame seeds in their diet instead. Foods like fish, meat, mushrooms, sunflower seeds and soybeans can fulfil your selenium requirement. Read more about yoga asanas to relieve symptoms of thyroid disorders. # 10: According to a study published by Indian Journal of Endocrinology and Metabolism, 10.95% of the 5,376 people surveyed were diagnosed with hypothyroidism. This is an alarming number and more awareness about thyroid gland and the diseases associated with it is the need of the hour. (Read: How Deepa survived thyroid cancer).